Floor plans give you view of rooms and spaces to show how they are arranged. Physical objects can also be drawn on floor plans to represent their layout on each level of buildings. 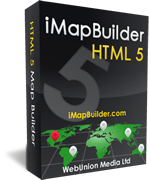 Interactive floor plans can be created by using your own plan images, by importing into iMapBuilder Online (Flash) or iiCreator (HTML5). Import your floor plans to create plan templates for interactivity. Add points and draw polygons over the plans to annotate the rooms, booths, spaces and physical objects. Information boxes to reveal details of each object. Interactive & annotated floor plans can be published as standalone plans or embedded into web pages. Database connectivity to drive dynamic information on floor plans. Trade show organizers can use an interactive floor plan as a rich locator map for exhibitors, with their details shown upon selecting a booth/ room. Event organizers can use the system to manage vacancies of venues. Real time floor plans can show the current occupancies, and heat maps can be generated from occupancy data to maximize usage of venues. Malls can use these floor plan maps as shop locators. Hospitals can integrate the plans with medical data to show directions to wards or consultation rooms. For those users who have no idea of creating interactive flash maps, please take a few minutes to watch the online video tutorials!